I painted this one thinking of Mother's Day coming soon. 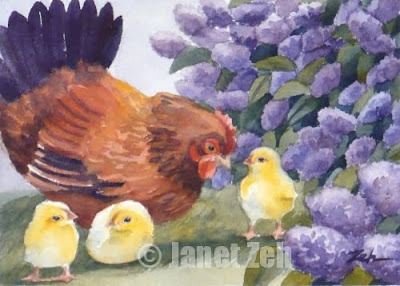 Three little chicks share the sunlight and the sweet scent of lilacs with their mom. Lilacs bloom here around Mother's Day, so I thought they are very appropriate for this painting. Find my animal art prints for sale at Zehland.Etsy.com. Thanks for stopping by today! I really love watercolor painting when I was younger but my art are not that good. But i still treasure them :) Yours is really good :) This is a great gift for Mother's Day. Thank you Kay. Watercolor painting is fun, isn't it? I don't blame you for loving it and treasuring the ones you did. I appreciate your comments and support.